Maintaining your luxury vehicle means bringing it in for routine maintenance via Service A or Service B. * Luckily, when you choose Schumacher European for service, you can benefit from our rotating auto repair specials. Whether you need new tires or brake service, you’re sure to find something for you in our rotating service specials without overspending on routine service procedures. Be sure to check out our brake service specials, parts specials, and available accessories online before making your way from Scottsdale to our service department! Get ready for spring with a freshly detailed Mercedes-Benz and enjoy $50 in savings with this limited offer. Cannot be used on previous services performed. Coupon must be presented at time of write-up. Cannot be combined with other offers or coupons. Restrictions may apply, see your service advisor for complete details. Help extend the life of your tires and keep your Mercedes-Benz driving and handling at its peak, while enjoying $50 in savings with this limited offer. Only at your Schumacher European. Coupon must be presented at time of write-up. Cannot be combined with other offers or coupons. Restrictions may apply, see your parts advisor for complete details. If you’ve never brought your car to our Scottsdale-area Service Department, we encourage you to give us a try. Our Mercedes-Benz technicians will get you and your vehicle back on the road as quickly as possible, and we never use high-pressure sales tactics or try to sell you services with no real value. The experience and expertise of our friendly, helpful staff are among the best you’ll find anywhere in the nation. Your questions are always welcome and we’ll be more than happy to take you into the shop to show you what your car needs and why. We will work within your budget and prioritize for you what repairs are needed today and what can be done at a later date. 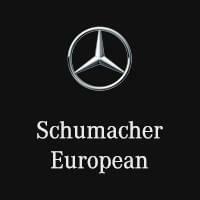 At Schumacher European you’ll find the accent really is on quality! It’s in everything we do, especially in building lasting relationships with our customers. Whether your luxury vehicle is in need or routine maintenance or major repairs, you can rely on our trustworthy service experts to get the job done. We look forward to helping you get the best price on Mercedes-Benz service in the Fountain Hills area. After exploring our Mercedes-Benz incentives, make your way from Cave Creek to our Service Department at your leisure. *Price advertised for Service A/Service B includes all factory-required components. Please refer to your maintenance booklet for the complete list of factory-required services and details on the specific intervals for your vehicle’s year and model. (Valid for MY09-newer).